Tank capacity in ounces 192.00 oz. Dimensions (inches) 15.4(Width) x 23.2 (Height) x 10.8 (D)in. Also known as: RCA 50-Pint RDH505. 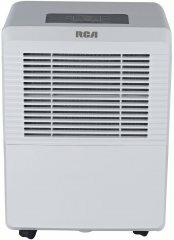 RCA dehumidifiers 2019 View all the new RCA dehumidifiers.